The Charleston Santa Teresa Hotel offers a regal mix of historical grace and contemporary cool, enhanced by the warmth of Colombian hospitality. Nestled in the heart of a UNESCO World Heritage site, this hotel on Colombia's Caribbean coast provides guests with a perfect base to explore this enchanting colonial fortress city. Sumptuous guest rooms, each decorated with unique flair, provide a tranquil retreat. Unwind at the full-service spa, then experience the magic of a Caribbean sunset over dinner at La Terraza. 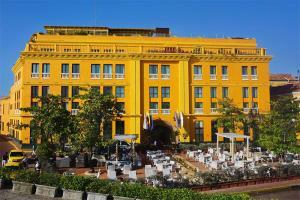 The hotel is 5 miles from Rafael Nunez Airport, and a short was to Santo Domingo Square.